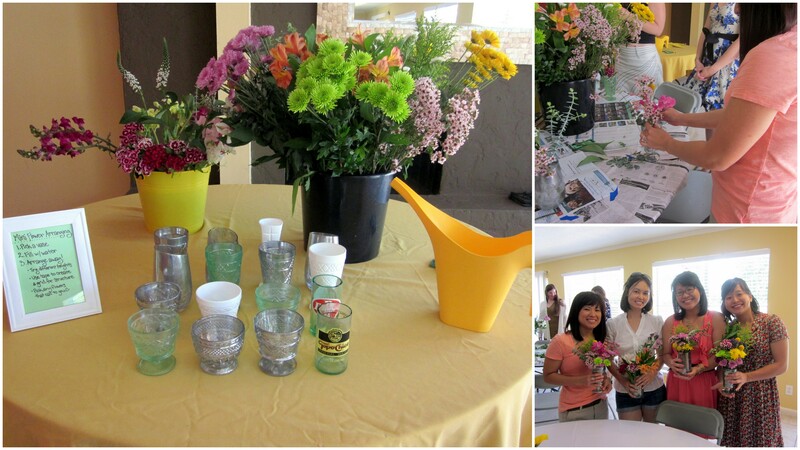 This past Sunday, I hosted a ladies brunch with some mini-flower arranging. 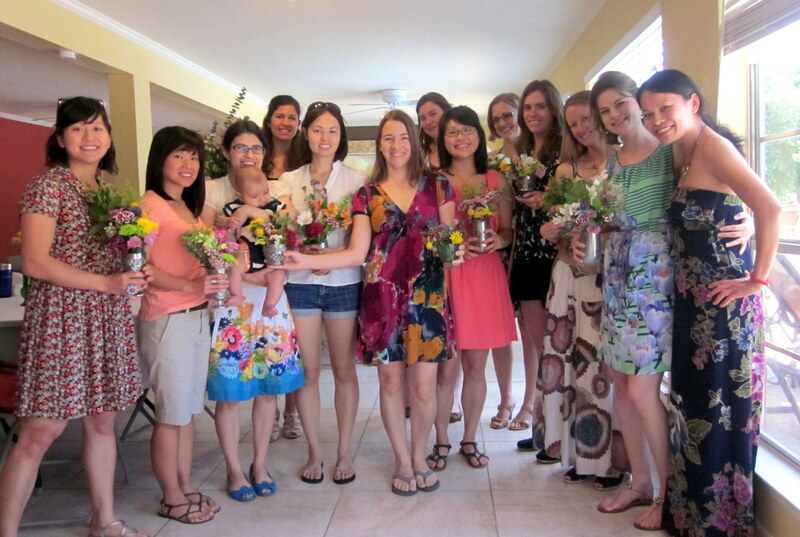 It was a beautiful, sunny day to brunch with a dozen of my lady friends who were decked out in floral. 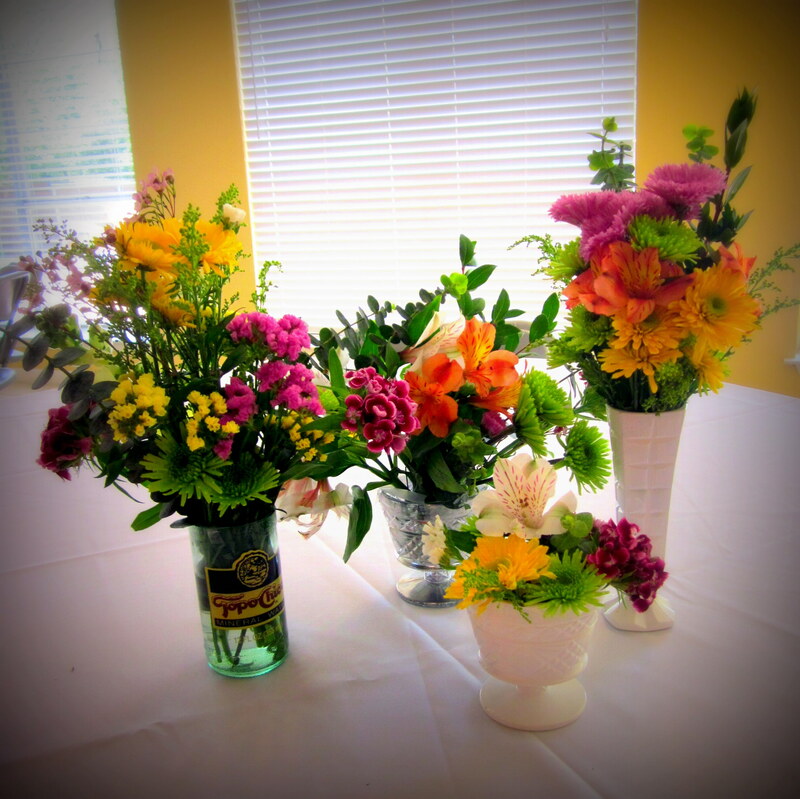 The painted vases didn’t exactly hold up well when filled with water, but everyone seemed to have a lovely time semi-DIYing flower arrangements. Below are the highlights from Sunday. 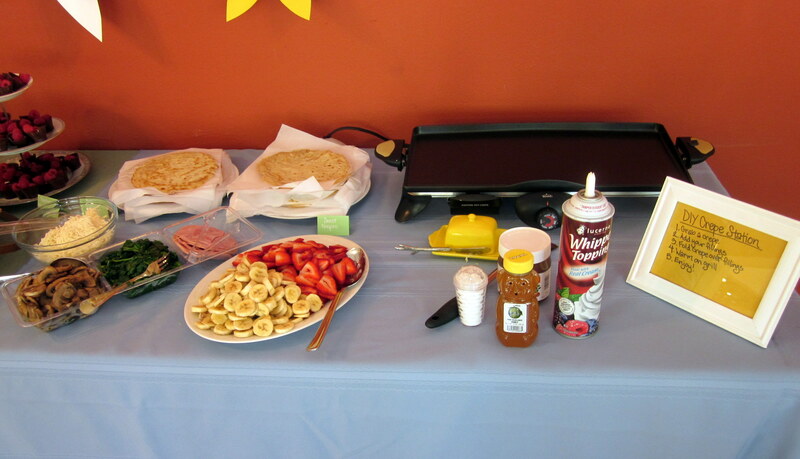 The food table was focused on semi-DIY crepes. I set out spinach, mushrooms, ham, and mozzarella cheese for savory crepes. For sweet crepes, there were strawberries, bananas, nutella, honey, powdered sugar, and whipped cream. People used the table grill to heat up their crepes. The Kitchn Crepe Recipe for sweet crepes – this was my favorite recipe but also the most labor intensive. The crepes came out nice and thin but were difficult to flip—resulting in 5 lost crepes. I let the batter rest for 9 hours before pouring crepes. Alton Brown’s Crepe Recipe – 1 sweet batch and 1 savory batch. These were a good middle ground in that the recipe only called for refrigerating the batter for 1 hour and the crepes turned out like what you would expect crepes to look like. AllRecipes Basic Crepe Recipe for savory crepes – this made the thickest crepes of the 3 recipes I tried. I should have added more water. But it might have just been me since the recipe has really high reviews. Hashbrown Bites from Petite Foodie – I quadrupled the recipe but only used 3 eggs, 1 cup of bread crumbs, and 1 tsp of salt. I couldn’t keep them warm so they didn’t taste that great. 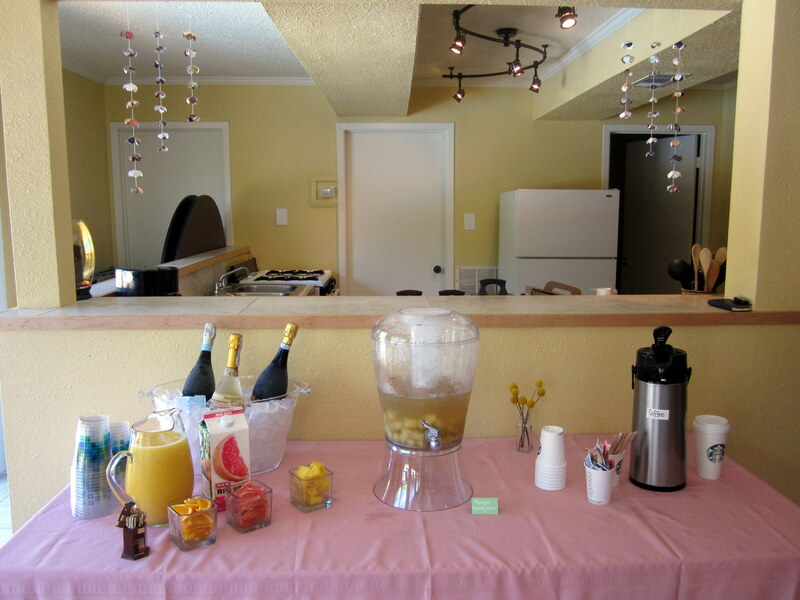 Mimosa Bar with prosecco, orange juice, grapefruit juice, and pineapple juice. Pineapple-Rosemary Water from Rachael Ray – the club room refrigerator was set too high and froze the water. 😦 I quadrupled the recipe and added extra water but only doubled the pineapple so it mostly tasted like rosemary once it actually defrosted. 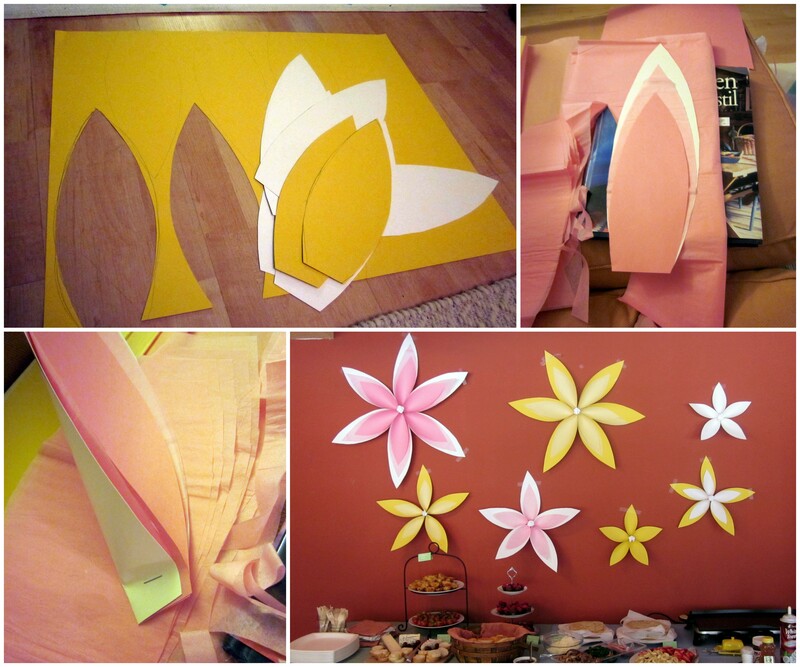 Large Paper Flowers from Jesi Haack Design – these were fun to make but hard to hang on the wall. Here are some of my pictured steps but Jesi provides a great tutorial. The flowers went above the food table. 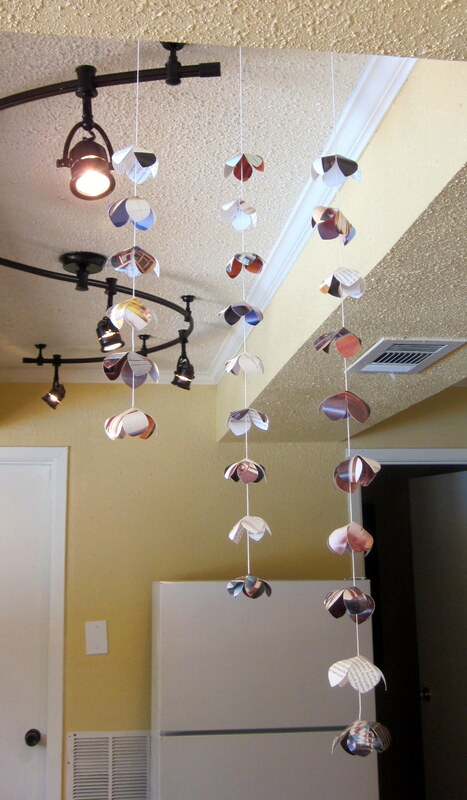 Paper Flower Garland from The Elli Blog – I used my Cricut to cut out the flower templates on pages from a thrifted German wood crafts book. This was a very labor intensive craft with cutting out the flowers, curling the petals, gluing the petals together, stringing the flowers, and then gluing the flowers in place. The flowers with long petals looked imbalanced when glued together so I didn’t use them. I would not do this again unless it had a more lasting use. I hung the garland over the drinks table and on the front door. I bought flowers from Central Market, and everyone used their creativity to make what spoke to them. All the mini-arrangements turned out nicely. This entry was posted in Crafts, Food and tagged Brunch, Crepes, Flower arranging, large paper flowers, paper flower garland. Bookmark the permalink. Looks wonderful! 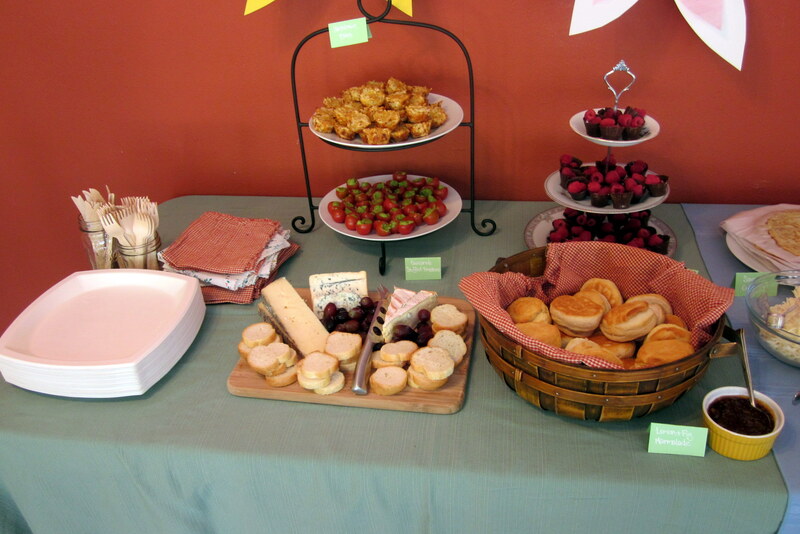 Delicious spread, awesome flowers!